She does not appear all that striking with a midnight black coat and a mane and tail to match. Her tail is of an average length, reaching down to just barely brush the ground. Her mane is cut into a mohawk until it reaches her forelock, which falls down her face to her muzzle and has three grey streaks running through it. Her tail also has a single grey streak running along the top to the bottom. 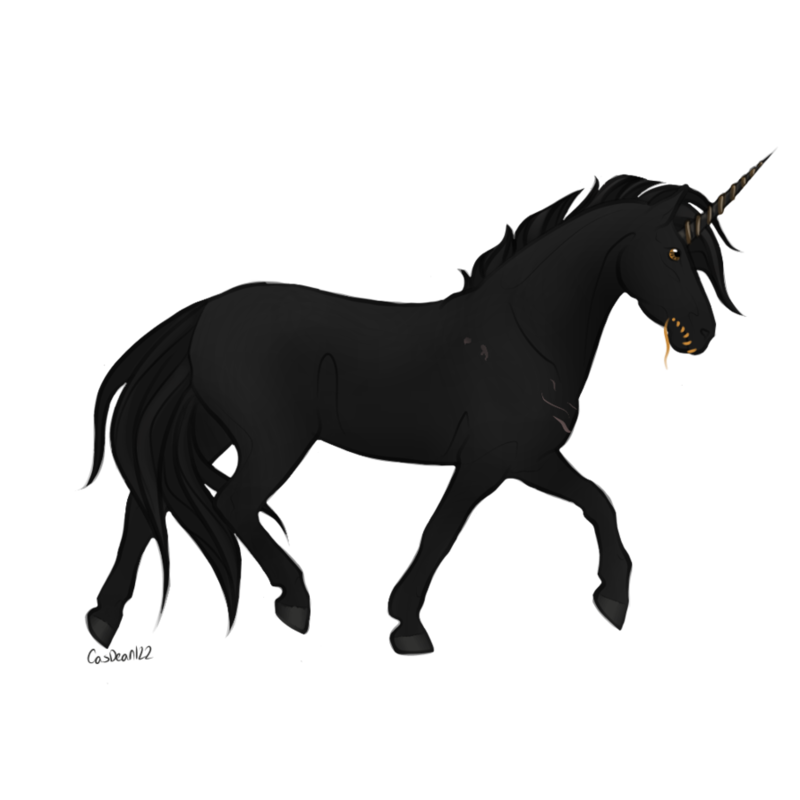 Black cloaks her hooves and a horn of the same color spirals from her forehead. The black of the horn is broken only by a line of gold that wraps around from the base to the tip. Golden eyes peer out from her head and match the gold on her horn and the thread that wraps through her lips, holding her mouth shut. Her teeth, although never visible, are similar to those of a velociraptor and her tongue is pointed to match. Ezera had been born to a young mother and an absent father. Her mother hadn't been right in the head, not since her father had left. It hadn't been an immediate change in behavior but eventually this left the small filly to watch out for herself as well as the mare that now walked around searching for someone that the girl didn't even think was real. It was hard to believe in someone that she had never met, especially when that someone had just left them without a word. Being so young and having to care for her own mother made it so that the filly had to grow up fast. Being a mute this didn't bother her much since she wouldn't have made many friends anyway. It was like this for a couple of years until the attack that took her mother. She wasn't sure exactly what had happened, only that she was knocked out and afterwards there was blood, pain, a golden thread, and no mother. Ezera quickly found out that it was there due to some kind of magic since there was no way to get it out and it seemed to grow with her. Eventually she made her way to Elysium where she had Iracebeth. Everything else before and after that really didn't matter except for when she found her daughter again. Now she's here with Andante and Iracebeth, wondering what will happen next. [X] Apprentice : She can only get a few thoughts across, such as telling someone her name. [ ] Adept : The connection lasts longer, allowing more information to be sent over. "Yes" and "no" questions can be answered as well as more detailed questions (with some effort), although after a while the connection will fade. [ ] Master : The connection lasts as long as she wishes and she can get any information across. It is no longer an effort for her to send her thoughts across, the magic is as easy as breathing. [ ] Virtuoso : At this level the magic would allow her to turn the thoughts of others into her own, almost like a form of mind control. Companion :: Arzaz (Hellhound) - This female beast would never be mistaken for any normal wolf. Even though she's just pup at the moment (about a year and a half) her head reaches Ezera's shoulder. By the time she's fully grown Arzaz will be around 20hh, maybe even a little bit taller. The bulk of her body is muscle which makes her a powerful force when she wants to be. Her fur is a smoky black that covers her entire body except her head, which is an ivory skull. The skull is thick and contains a mouth full of pointed teeth with four large canines, two on top and two on the bottom. Smoke curls around them as well as out of the nostril holes. Where the eyes should have been is an endless black that, if you were to look close enough, would seem to be swirling with the same smoke. Curled talons come out of the three toes on her paws and click against the ground while she walks. Arzaz stays this way until she gets excited, angry, or protective. When this happens her chest starts to burn with a golden color that travels up to her face. The gold turns into bright flames of the same color that fill in the eye-holes of the skull, the nostrils, and flicker inside of her mouth.